MY nine-month-old daughter has been swaddled since she was born and still won't settle unless she is tightly wrapped. Now she’s getting big she’s unravelling herself at night and is waking up. Any ideas how I can wean her off being swaddled? Swaddling is a technique that works so well with newborn babies, after leaving the womb where space is small they are used to being snug and tight. Babies love to be swaddled in the early months, it mimic the womb and it also helps to avoid them waking when they startle ‘babies have a startle reflex’ even while sleeping. 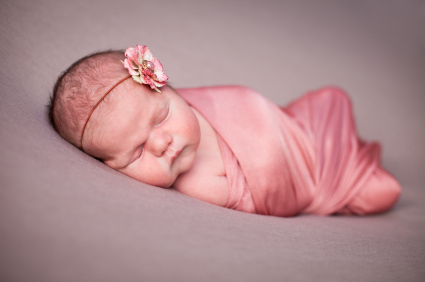 So we swaddle, and swaddling is well used across lots of different cultures around the world. However, your baby like lots of others become so use to being swaddled as part of their sleep routine, in her brain it is linked to relaxing and falling asleep. Her brain then becomes dependent on swaddling the longer you swaddle for. Usually it isn’t a problem, but sometimes it is so linked that they simply will not swaddle or relax without it. You can be sure that once you go back in and reswaddle her, she promptly stops her protest and falls back to sleep. You now need to ‘wean’ her off the swaddling – my suggestion, now that we are entering the cooler months in to her her in a sleeping bag and wrap the swaddle over the top of her. Gradually each time you put her down for a sleep during the day, make the swaddle just that bit loose, bit by bit, loosen the firm wrap. You are aiming to be actually a month down the track and the swaddle is now like a little sheet that is loosely placed over her, then you simply remove from the cot so that it doesn’t become a safety hazard. During the night it can be harder,try to avoid re=swaddling during the night. I would make sure that you add in other sleeping cues at nightime, such as some relaxing music as you swaddle and place her in her cot, so that once the swaddle is no longer used, she still has the music – this is called ‘pairing’ another cue in with another. This shows us how strong sleeping cues can become, so make sure the sleeping cues you use work long term for you. I recommend to parents to move from a swaddle to a wrap by 12 weeks of age. Also be careful when swaddling that it is from shoulders to tummy that the hips are just loosely wrapped as tight wrapping on hips can cause problems in hip formation.